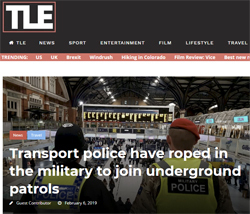 In what many are seeing as a prelude to Army troops being put on the streets of our major cities, following the UK leaving the EU; the Government have trialled Military Police being used on parts of London's underground network and is now about to introduce the 'army police' on all of the City's underground network. The excuse given is logical of course - a shortage of British Transport Police - and that of regular police numbers across the country. However, this hides the true reasons - the Government is preparing for food riots and acts of civil disobedience, not to mention increases in crime, following food and medicines delays caused by the lack of Customs Officers at the Port of Dover. Whilst The Port of Calais authorities have prepared for a 'No-Deal' Brexit to happen, they have put in place procedures that will not delay any goods leaving Calais for the UK. This of course is in stark contrast to the British Government! “This is a great, practical way to bring two specialist police organisations together to share expertise and enhance what we do." “By giving Royal Military Police personnel the opportunity to shadow our teams at two of London’s busiest stations they’ll be able to gain first-hand experience of wider policing. There are clear benefits brought by the increasing uniformed visibility at our key transport hubs in relation to crime prevention. The uniqueness of having joint military and police personnel on patrol also provides a conversation starter with the traveling public and assists with engagement in line with NPT principles. Whilst the Government is busy denying there are any plans to put troops on the streets of the country's major cities, the Sunday Times edition of January 27th revealed the government has been gaming their plans for martial law, a state of emergency, curfews, and other drastic measures in the event of disorder after a no deal Brexit. Worse still of course is the delay to food and medicines which has been predicted by authorities across the country and specifically worrying the NHS Bosses whoa re are reported to be literally on the verge of panic!